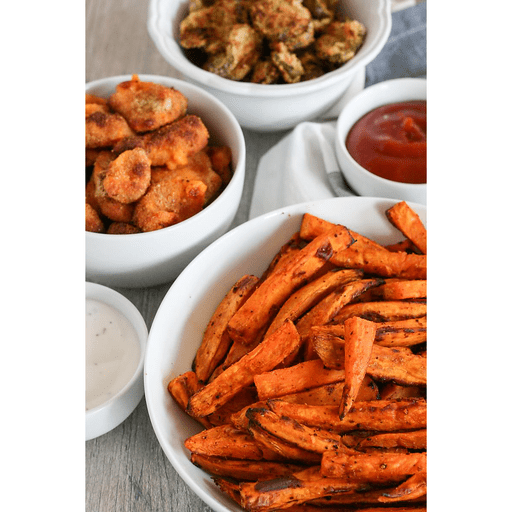 We took our favorite appetizers, like sweet potato fries, and transformed them into air fryer recipes. The result? Perfectly crunchy goodness that will be a hit at your next party. 1. Preheat air fryer to 400°F for 8 minutes. 1. In a large bowl, toss sweet potatoes with olive oil, garlic powder, paprika, salt and pepper. 1. Lightly spray the fryer basket with cooking spray. Place half the fries in the basket, being careful not to overcrowd. Cook for 8 minutes, turning halfway through the cooking time. Repeat with remaining fries. 1. Serve immediately with favorite dipping sauce. Calories 70, Total Fat 2.5g (Saturated 0g, Trans 0g), Cholesterol 0mg, Sodium 20mg, Total Carbohydrate 12g (Dietary Fiber 2g, Sugars 4g, Includes 0g Added Sugars), Protein 1g, Vitamin D 0%, Calcium 2%, Iron 0%, Potassium 6% *Nutritional values are an approximation. Actual nutritional values may vary due to preparation techniques, variations related to suppliers, regional and seasonal differences, or rounding.